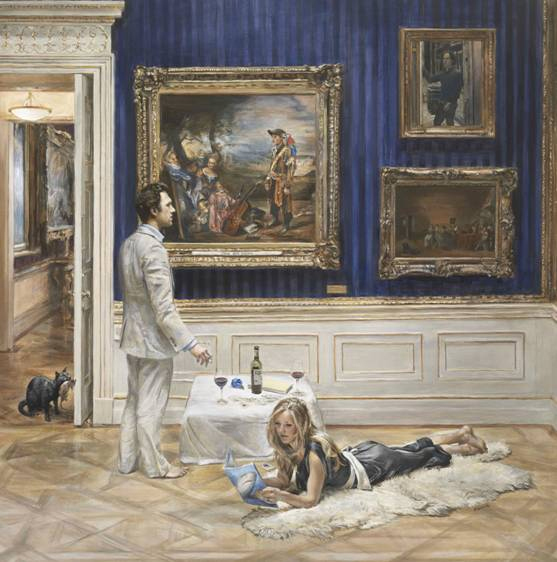 Artist Christian Furr was born in Heswall, Wirral in 1966. He became the youngest artist to have ever officially painted Queen Elizabeth II, when in 1995 – at the age of twenty eight – he was invited by the Queen to paint her portrait at Buckingham Palace. The work was commissioned by and hangs at the Royal Overseas League, St James, London. Art work from Furr features at 45 Park Lane – the third hotel in the UK from the Dorchester Collection, which opened in London at the end of October 2011. He has been asked to paint many people internationally including a portrait of the late HRH Crown Prince Bin Abdul Aziz Al Saud, Cardinal Cormac Murphy-O’Connor for Westminster Cathedral and Tim Henman (for Robinsons). His most recent paintings are on display here. ‘Before the Wedding’ and ‘On the Threshold’ of his cat ‘Chunky’. His new portrait of American Burlesque star Dita Von Teese which is not yet released. Christian has appeared on television internationally judging and teaching Art and is author of the books on Art ‘The Lost Art’ & ‘Take Art’. In June 2004 the artist collected an AoC Gold Award at the House Of Commons, given to further education college alumni who have gone on to achieve excellence in their chosen field. Former winners include Jamie Oliver, Betty Boothroyd and Jimmy Choo. He has exhibited around the world and at shows and galleries including the Saatchi Gallery in 2010 when he acted as Judge and curator for the ‘Art of Giving’ Art exhibition, The Royal Society of Portrait Painters, The National Portrait Gallery and the Royal Watercolour Society. Furr’s work rarely comes onto the open market but is commissioned privately by clients worldwide.